Like many other world cities, Tel Aviv is notorious for the scarcity of its parking spots. You make a ten-minute drive in the city only to find there is no parking space in sight and end up searching for another 30 minutes at best, or parking at a long distance. Fed up with the experience, two Israeli entrepreneurs—mechanical engineer Asaf Formoza and nanophysicist Udi Meridor—founded City Transformer Ltd. in 2014. 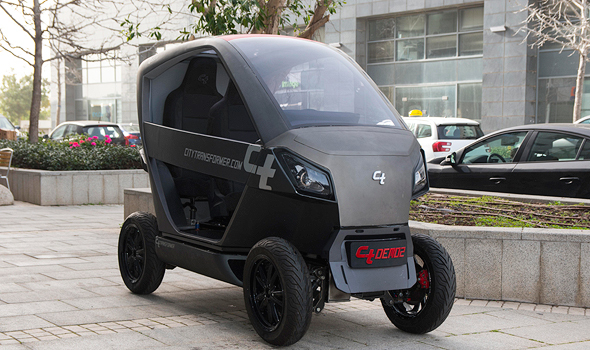 Based in Kfar Netter, a village in central Israel, City Transformer develops an ultra-light electrical vehicle capable of folding its chassis at a push of a button, to a width of just 1 meter, similar to that of a large motorcycle. When folded, up to five City Transformer vehicles can fit into a single traditional parking space. “I see more and more young people who don’t even bother to get a driver’s license and older people forgoing their traditional vehicles because they view them as a burden,” Formoza said in a phone interview with Calcalist earlier this month. Still in development, a City Transformer vehicle goes up to 30 km per hour and will be capable of up to 90 km per hour in its regular state and 45 km per hour when folded, following regulatory approval, Formoza said. The vehicle is scheduled to hit the market in about two years. Preorder will start in the next two to three months, according to Formoza. After completing its next funding round, City Transformer is planning to launch a pilot program in Tel Aviv next year, with drivers offering free rides around the city, he said. At a later stage, the company is looking to launch a car-sharing service in the city using a designated app to locate, unlock, and pay for the use of vehicles, he added. Users will be able to sign in to any City Transformer vehicle around the world, importing their personal preferences and usage history for a personalized experience, said Formoza. City Transformer has about 10 employees and has raised 1 million euros to date. Good, but is a copy of Renault Twizy with six years delay compared to Renault ! Flintstone mobile. Do feet extend through the floorboards? Might be better than it looks though. "wind turbines in the grills to produce electricity while car is moving" Far fetched? Yes. more than just far fetched. This would defy the laws of physics.The drag would be increased and thus you need more power to drive. A lot more power than the turbines could generate.